This coming weekend is when the Clocks go back an hour here in the UK. This leads to the red kite feeding being at 2pm from Sunday 25th October as red kites don't know that we humans alter the time.. The numbers of red kites now coming in for their lunch have already reached many hundreds, and this is just the beginning of the winter season. The above movie comes in large sizes according to your selected device - computer, iphone, or 3g phone. There has been no news on the last young kite to leave rehabilitation since it was picked up last month and taken into care at another establishment. I hope to have more information before the next post..
Labels: Feeding, feeding station, Gigrin Farm, red kite rehabilitation, red kites. 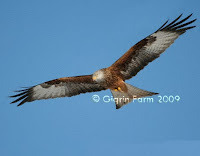 Hundreds of red kites coming bang on the time we say at the moment - 3pm ( all will change next week of course). Last week was when diesel was bought for our Petrol generator.. I took our horse box into town to collect the repaired machine, loaded it, shut the gates, and proceeded to drive off with the tail gate dragging on the ground!! Arragh@ I am now in the firm belief that a break is in need! However it will be next month before I can think of that as plans to add to our kite centre are on going at the moment.. The Wireless system being used to bring video from the rehabilitation units has proved to be unable to provide the images we had hoped for. So, on Thursday, our local contractor was employed to cut a trench for a hard wired link instead. These things are never straight forward and sure enough..
At 10pm that evening, I was repairing the ripped up pipes by torch light. But sawing a straight edge on one of these pipes with a hacksaw I also managed to saw partway through my thumb(!). So, with my being unable to hold the shovel comfortably, the kites have been fed by Colin these past days, and he will be on the case again tomorrow. There are already well over 300 of these beautiful birds coming in at 3pm. I hope to have a video camera set up tomorrow with the expectation that I'll have something extraordinary to put in clip for the web site. 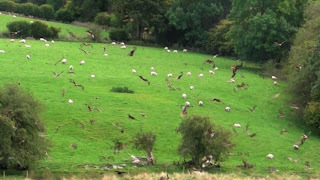 The 20yr old red kite has left the unit with new tags (Pink R). He only has another 3 years to go to break the known record for a red kite. No. 63 has been found in a poor way and is currently being cared for some miles from here. If/when he is deemed fit enough the bird will come back here for another spell in the rehabilitation aviary.